Not going to lie, I didn't enjoy this one nearly as much as I did Fantastic Four: Season One. 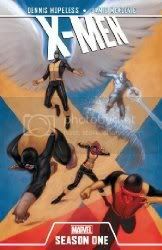 Maybe it's because I'm far more familiar with the origin story of the X-Men than I am with the Fantastic Four, but some of the updates that were made to the main cast of characters in this volume just don't seem to mesh well in my mind with what has come before or since for them. Alas, not a great addition to the Season One books, as far as I'm concerned.